They called themselves Slick, Thumper, Popeye and Stubby. Bam Bam, Dutch, Chopper. Colorful nicknames for some of the guys playing ball for the local weekend league? Not quite. These are just a few of the members of the Aryan Brotherhood of Texas (ABT) recently taken down on charges ranging from racketeering to murder, and these violent criminals don’t play games. 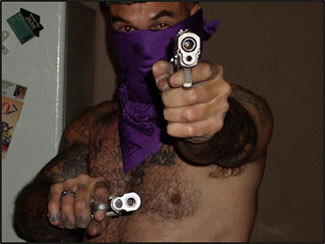 Former Aryan Brotherhood of Texas General Steven Walter Cooke, now serving a life sentence for murder. That was six years ago. The ABT operating in Texas today is, according to U.S. Attorney for the Southern District of Texas Kenneth Magdison, an “effectively dismantled” shadow of its former self thanks to a Bureau of Alcohol, Tobacco, Firearms and Explosives (ATF) investigation that started on a jailhouse tip in 2008, then quickly grew to a close-knit statewide task force of dozens of local, county, state and federal law enforcement agencies working in partnership to end the ABT’s reign of terror. 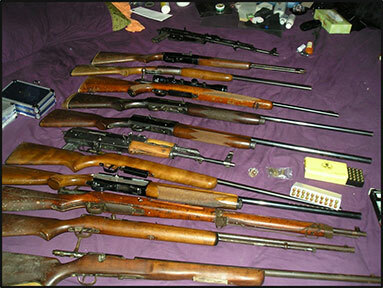 Some of the evidence seized during the ATF–led six year Aryan Brotherhood of Texas investigation. Over a six-year period, the ATF-led task force investigation amassed a vast and horrifying dossier of charges against the ABT, including murder, murder for hire, kidnapping, aggravated assault, aggravated robbery, trafficking in firearms, drug dealing, counterfeiting, and identity theft. The operation wrapped up in September 2014 as the last of 73 accrued convictions rolled in. Thus far it has resulted in six life sentences and more than 900 years of combined sentences for ABT members. To learn more about the ABT and the six year investigation that brought it to its knees, visit the ATF website and read the details of the last 36 convictions in the case that came down in September.